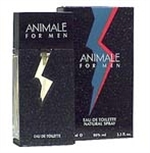 Animale Parfums Introduced Animale in 1993, Animale is classified as a refreshing, spicy, lavender, amber fragrance. This masculine scent possesses a blend of citrus with accents of greens and flowers. Sandalwood, cedar and vanilla musk undertones. It is recommended for office wear. I wear it everyday and if i don,t have any to put on i don,t wear anything. My guy friend has this colonge and it smells amazing. He let me have his last bottle of it and I intend to get him another one pus getting myself one. This colonge is AMAZING! I love the smell of it too!!!!! I have been looking for this for ages. Love this perfume, been using it for years now and still getting compliments of it ... Ladies love it and attracts attention from them, that means it does its jobs perfectly. It is a signature fragrance.